Molecular clouds are nebulous patches of gas located primarily in the spiral arms of galaxies. Dense regions within these clouds collapse and form 'protostars.' Therefore, the birthplace of stars are molecular clouds where stars begin their lives as large and comparatively cool masses of gas. The contraction of this gas and the subsequent rise of temperature continues until the interior temperature of the star reaches a value of about 1,000,000°C (about 1,800,000°F). At this point, a nuclear reaction takes place in which the nuclei of hydrogen atoms combine with heavy hydrogen deuterons (nuclei of so-called heavy hydrogen atoms) to form the nucleus of the inert gas helium. The latter reaction liberates large amounts of nuclear energy, and the further contraction of the star is halted. Once the star has started nuclear fusion, it becomes a 'main sequence' star. Main sequence stars are stars, like our Sun, that burn hydrogen to helium in their cores. For a given chemical composition and stellar age, a star's luminosity (the total energy radiated by the star per unit time) depends only on its mass. Stars that are ten times more massive than the Sun are over a thousand times more luminous than the Sun. However, we should not be too embarrassed by the Sun's low luminosity: It is ten times brighter than a star half its mass. The more massive a main sequence star, the brighter and bluer it is. For example, Sirius - the dog star, located to the lower left of the constellation Orion, is more massive than the Sun and is noticeably bluer. On the other hand, Alpha Centauri, our nearest neighbour, is less massive than the Sun and is thus redder and less luminous. Since stars have a limited supply of hydrogen in their cores, they have a limited lifetime as main sequence stars. This lifetime is proportional to f M / L, where f is the fraction of the total mass of the star, M, available for nuclear fusion in the core and L is the average luminosity of the star during its main sequence lifetime. Because of the strong dependence of luminosity on mass, stellar lifetimes depend sensitively on mass. Thus, it is fortunate that our Sun is not more massive than it is, since high mass stars rapidly exhaust their core hydrogen supply. Once a star exhausts its core hydrogen supply, the star becomes redder, larger, and more luminous: It becomes a red giant star. This relationship between mass and lifetime enables astronomers to put a lower limit on the age of the universe. After a low mass star like the Sun exhausts the supply of hydrogen in its core, there is no longer any source of heat to support the core against gravity. The core of the star collapses under gravity's pull until it reaches a high enough density to start converting helium to carbon. Meanwhile, the star's outer envelope expands and the star evolves into a red giant. When the Sun becomes a red giant, its atmosphere will envelop the Earth and our planet will be consumed in a fiery death. The Sun will eventually evolve into a red supergiant as it exhausts the helium in its core. At this stage, it will have an outer envelope extending out towards Jupiter. During this brief phase of its existence, which last only a few tens of thousands of years, the Sun will lose mass in a powerful wind. Eventually, the Sun will lose all of the mass in its envelope and leave behind a hot core of carbon embedded in a nebula of expelled gas. 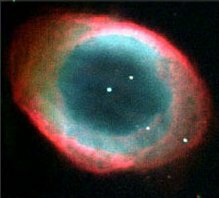 Radiation from this hot core will ionise the nebula, producing a striking 'planetary nebula', much like the nebulas seen around the remnants of other stars. The carbon core will eventually cool and become a white dwarf, the dense dim remnant of a once-bright star. The final fate of low-mass dwarfs is unknown, except that they cease to radiate appreciably. Most likely they become burned-out cinders, or black dwarfs. Massive stars burn brighter and perish more dramatically than most. When a star ten times more massive than the Sun exhausts the helium in its core, the nuclear fusion cycle continues. The carbon core contracts further and reaches high enough temperature to burn carbon to oxygen, neon, silicon, sulphur and finally to iron. Iron is the most stable form of nuclear matter, and there is no energy to be gained by converting it to any heavier element. Without any source of heat to balance the gravity, the iron core collapses until it reaches nuclear densities. This high-density core resists further collapse, causing the in-falling matter to 'bounce' off the core. This sudden core bounce (which includes the release of energetic neutrinos from the core) produces a supernova explosion. For one brilliant month, a single star burns brighter than a whole galaxy of a billion stars. Supernova explosions inject carbon, oxygen, silicon and other heavy elements up to iron into interstellar space. They are also the site where most of the elements heavier than iron are produced. Future generations of stars formed from this heavy element-enriched gas will therefore start life with a richer supply of heavier elements than the earlier generations of stars. Without supernovas, the fiery death of massive stars, there would be no carbon, oxygen or other elements that make life possible. The fate of the hot neutron core depends upon the mass of the progenitor star. If the progenitor mass is around ten times the mass of the Sun, the neutron star core will cool to form a neutron star. Neutron stars are potentially detectable as 'pulsars', powerful beacons of radio emission. A limit exists for the size of neutron stars, however, beyond which such stars are gravitationally bound to keep contracting until they become a black hole, from which light radiation cannot escape. If the progenitor mass is larger, then the resultant core is so heavy that not even nuclear forces can resist the pull of gravity and the core collapses to form a black hole.